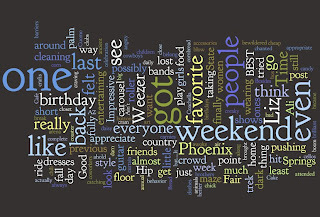 Lots of people have these things on their blogs; I've been playing around with Wordle over the past few weeks and decided to make and post one. Perhaps I'll do it from time to time. It's visually appealing and just cool. Go play. Oah!!! That's me!! I'm a sideways in your Wordle. I heart you.